The gaming industry is booming as a sector. In 2018 it will be worth an estimated $138 billion internationally and the strong double digit year-on-year growth of around 14% is expected to hold for the next decade. The growth in value of the mobile gaming sector is contributing most to the market’s growth, up 29% over 2018 and now accounting for 51% of overall revenues. However, it is not mobile gaming that is the market’s fastest growth sub-category. The honour goes to eSports – the term used for organised competitive gaming between teams or individuals. NewZoo, the gaming market data and research company, has predicted the eSports sector will see 38.2% growth in revenues over 2018, up to $906 million. 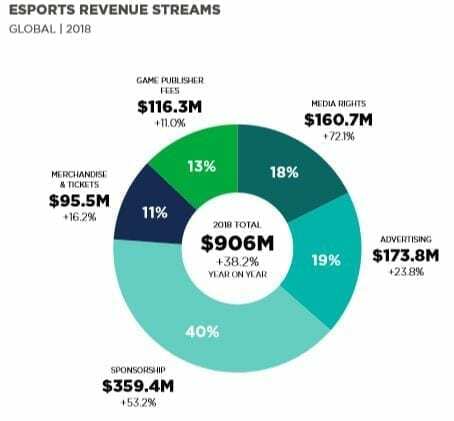 Statista.com estimates that will rise to around $1.7 billion by 2021.
eSports is a now being labelled as a ‘consumer phenomenon’ and many market analysts are saying that its rampant growth will be the catalyst that takes the value of the gaming industry beyond that of the actual sports industry. 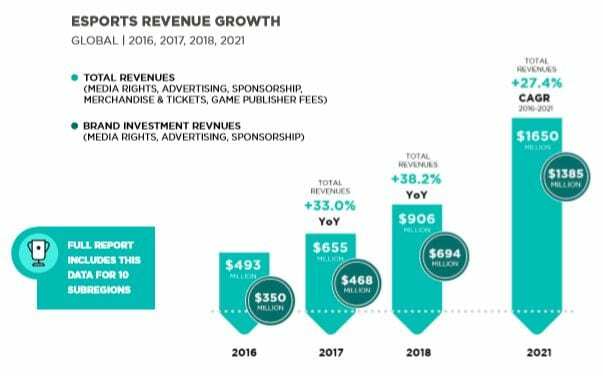 The majority of eSports revenues come from sponsorship deals. In 2018, brand sponsors are expected to contribute $694 million, accounting for 77% of total revenues, rising to $1.4 billion, or 84% of revenues, by 2021. The remainder comes from stadium ticket sales of those going to watch tournaments live, merchandise and gambling. Money loves high growth and investors, both from inside and outside of the gaming industry, are moving in. As business, eSports is entering a crucial phase. A few years ago it was a largely Asia-based phenomenon and while not a negligible development, certainly not a ‘mainstream’ sector. That is no longer the case. There are an estimated 165 million ‘eSports enthusiasts’ globally and the number is growing fast. 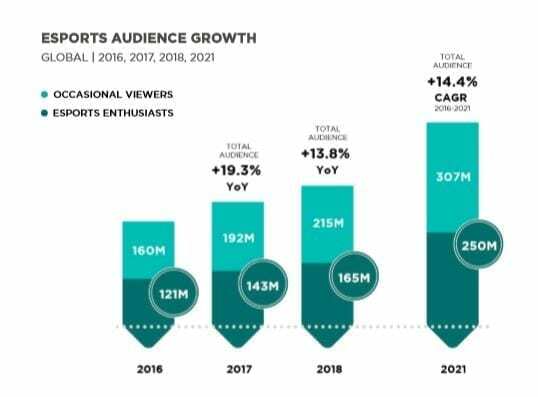 The ‘audience’, meaning those that will spend time watching eSports if not playing themselves, is bigger even at around 350 million. Both categories of ‘user’ are seeing strong double-digit year-on-year growth. As is common to ‘growth’ sectors, especially those growing fastest, money and investment in the eSports industry doesn’t mean that there is profitability. However, with eSports structures expected to be fully professionalised within 3-5 years and ‘maturity’ as a business to evolve within 5-10 years, interest is high. At a certain level of maturity valuable media rights competition will hot up and, as we have seen with English Premier League football, that’s where the real money, and profitability, will come from. But as a private investor, what are the opportunities when it comes to either investing directly in eSports as a sector, or gaining significant exposure to it? How Can I Invest in eSports? There are three main avenues that private investors keen on investing in eSports have. A small number of these options can be considered ‘pure play’ investments where the vehicles have exclusive exposure to the eSports industry. The rest are investments that target the gaming industry as a whole, which is by no means necessarily a bad thing given its current rate of growth, or offer a degree of exposure to eSports and/or the wider gaming industry. The three approaches that can theoretically be taken, though the first and second are suited to high net worth investors only, are VC funds, direct investments of the EIS and SEIS variety, and publically listed companies. March Capital, Crosscut, Courtside, Deep Space Ventures, Everblue Management, Greycroft, Index Ventures, CRCM, Catalyst Sports, Sterling VC and BITKRAFT. Unfortunately, these are also U.S. based, further complicating matters. That also means currency exposure to the dollar, which should be factored in to any investment case. They are also not ‘pure play’ eSports investments and while several have heavy exposure to the sector are not exclusively invested in it. That means some of the investment would be in other sectors which may not be desirable. However, for bigger ticket investors interested in eSports, perhaps worth further investigation. There are also a handful of VCs currently in the works which are expected to provide future ‘pure play’ investment options for eSports so those interested should keep an ear open for developments. The next avenue to eSports investment is through becoming a direct equity owner in a promising start-up in the space. The UK government’s EIS and SEIS schemes offer tax advantages that mean as little as around 35% of investments in qualifying start-ups is actually at risk, with the remainder tax deductible, partly directly following the investment and partly if it turns out to be loss making as the company doesn’t make it. The good news is that tax breaks are also in place for the upside of successful EIS and SEIS investments with capital gains tax not applicable on profits following an exit. Investors interested in this avenue can screen investment opportunities on crowdfunding sites and through angel investor networks and set up alerts for new opportunities which may come to market. It should be emphasised that investing in any kind of start-up is high risk and EIS and SEIS investments are illiquid and of a long term nature. Investors should carefully educate themselves on the pluses and minuses of investing in start-ups as well as the due diligence process that should be followed when making any final decision. The third avenue is that which will be most suitable for a majority of private investors – buying shares in publically listed companies directly or indirectly involved in the eSports sector. Companies with the greatest exposure to the sector are games publishers such as Blizzard Entertainment and Riot Games. Those two in particular have move quickly to invest in the sector and have now started to operate the North American League of Legends Championship Series (NA LCS) and Overwatch League (OWL) in a franchised structure. Chinese ‘big tech’ companies such as Tencent, which is heavily invested in the mobile gaming space and are ramping up their exposure to eSports are another option. Tencent, Activision Blizzard, Electronic Arts, Nintendo, NetEase and TakeTwo. However, right now, while a growing part of their businesses, their eSports investments are still unlikely to really move the dial hugely when it comes to their share price. However, that can be expected to gradually change over the next few years as the size of the industry, and its value, grows. There are other companies that also have exposure to eSports, but it forms an even smaller part of their wider business interests than those listed above. Companies in this category would include the likes of gaming microchip maker NVIDIA, Sony, Microsoft, Apple and Amazon. Even more diluted eSports investment plays would be media and telecoms companies circling eSports broadcasting rights. Twitch, the gaming media platform recently did a deal with the OWL league worth $45 a year Time Warner, which AT&T is currently trying to acquire, owns Turner and Warner Bros. The former owns and operates the eSports ELEAGUE and Warner Bros. publishes games and own Twitch rival video-gaming streaming platform Machinima. Disney is even involved through a majority stake in BAMTech which operates digital streams for League of Legends. There are also a couple of gaming industry-focused ETFs now. The most popular of these is the New York-listed ETFMG Video Game Tech ETF (GAMR). These invest in a variety of companies in the gaming industry, from software to hardware and components, including many of those mentioned. The advantage of an ETF is diversified investment risk, with capital spread across a significant number of companies. Direct ‘pure play’ investment in eSports is still tricky but can be expected to grow as an opportunity over the next few years. New ETFs that are expected to appear probably represent the most suitable option for private investors, due to the diversified risk. The video games publishers most heavily involved in eSports are probably the most direct investment in eSports currently available to investors, excluding those that have the financial wherewithal to take the VC or direct start-up investment routes. Is The News Anchor’s Days Numbered As China’s State Media Introduces AI Replacements?